Focus Professional Education is one of the few institutions whose programmes are dedicated to create employment opportunities in both of these sectors. The Programmes are few uniquely designed to create the demands of all working industries. 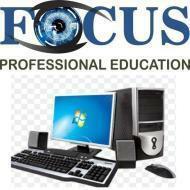 Focus Professional Education conducts classes in Autocad, Computer Course and Java Training. It is located in Khanpur, Delhi. It takes Regular Classes- at the Institute.